The Ghana Project is a fellowship program founded in 2013 as a joint venture between FIUGA and the Ghanaian College of Surgeons to address the need to train Ghanaian doctors in treating women with female pelvic floor disorders. The goal of the project is to expand knowledge around post-fistula repair incontinence and the treatment of genital prolapse, urinary incontinence, and overactive bladder syndrome, and to create a self-sustaining training center of excellence in West Africa. This fellowship is the first accredited FPMRS fellowship in West Africa to train Ob/Gyn doctors to become sub-specialists. The program requires the fellows to complete both clinical and research components to obtain board certification in FPMRS. In order to launch this project, FIUGA donated numerous supplies and equipment. In the early phase of the program, the emphasis was mainly on basic surgical skills. FIUGA selected FPMR surgeons in academic medicine, who were also members of IUGA, and invited them to travel to Ghana (Accra and Kumasi) to teach the fellows. In the initial years of the program, FIUGA sent visiting faculty on a monthly basis for 2 weeks. 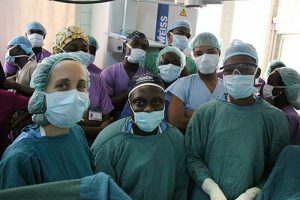 After 3 years, once the Ghanaian faculty members and the fellows gained the necessary skills to perform essential female pelvic reconstructive surgery and understand the fundamental principles of the specialty, the frequency of visits was reduced to quarterly. In 2015 the first FPMRS fellow graduated and now practices as a faculty member. In 2017, two additional fellows completed the program and are now serving as vital faculty in the medical school and residency and fellowship programs, emphasizing in teaching FPMRS. FIUGA and industry partners continue to contribute supplies and equipment to sustain the program. In 2017, Laborie donated 2 urodynamics machines to each site and they are now performing studies for those women who have complex pelvic floor issues. 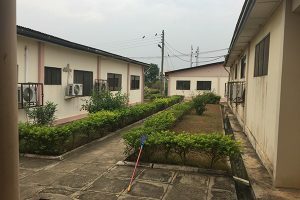 In 2018, FIUGA funded the first visiting female pelvic physical therapist to teach in Ghana, both at Korle Bu Teaching Hospital in Accra and Komfo Anoykye Teaching Hospital in Kumasi. During the two-week visit, the medical students, residents, physical therapists, FPMRS fellows as well as the faculty members were exposed to the concept of female pelvic floor PT. This was considered to be an eye-opening experience for them. FIUGA is committed to supporting and expanding these vital and much needed programs. In addition, FIUGA is providing to the Ghanaian faculty, fellows and residents a remote lecture series comprised of 50 video lectures contributed from expert urogynecologists throughout the world. This lecture series, covering key issues in FPMRS, will also be made available through the IUGA Academy to all members of IUGA for teaching worldwide. The Ghanaian fellows are also exposed to FPMRS at the University of Cape Town, South Africa, for a period of 6 months. FIUGA also supports the fellows’ travel to IUGA’s Annual Meetings. In 2018, FIUGA plans to obtain grant funding in order to continue the clinical and research components required for board certification in FPMRS. Through our joined efforts, we can achieve the goal of teaching the teachers and creating a self-sustainable FPMRS program. Your donation will support educational programs for urogynecological professionals, help educate the general public and patients about pelvic floor health, fund research for treatment of pelvic floor conditions, and provide scholarships to advance research and practice. 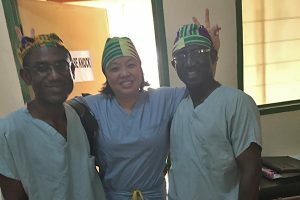 Recent interview with Dr. Ganyaglo and Dr. Azanu, two subspecialty trainees in Ghana.